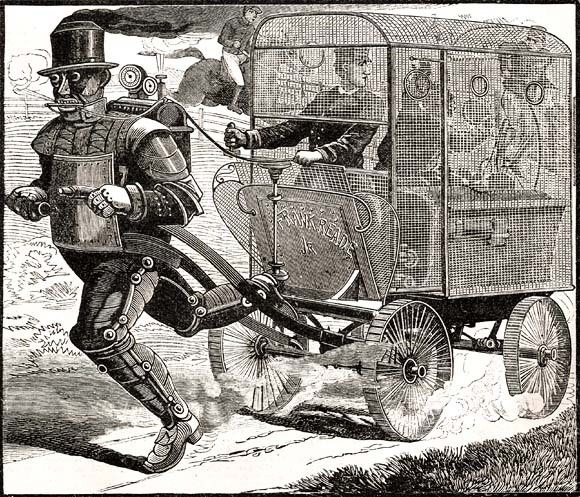 In early February 1879, Frank Reade Jr. began work on a third-generation Steam Man. Inspiration for this undertaking came from a friendly wager between father and son. Frank Sr. had declared that his Steam Man Mark II could not be improved upon. Frank Jr. rose to the challenge and, in three months, produced his version of the now famous creation--the Steam Man Mark III. Above: Frank Reade Jr. takes the Mark III on its very first excursion. In the back of the wagon is Pompei DuSable, whose brother Joliet helped Archibald Campion in the construction of Boilerplate. Note the engraver's faciful placement of a horse and a bicycle being outpaced by the new form of transport. On May 4, 1879, Frank Jr. assembled a small group to witness the Mark III's unveiling. Included at the event was a young writer named Luis Senarens. He had traveled by rail from New York City to Readestown, Pennsylvania, specifically to witness one of the Reades' steam men in action. Senarens was so astounded by the Reades and their accomplishments that he requested to be made their official biographer. The Reades, in turn, were impressed enough with the novice scribe to grant him access to their journals and records. This symbiotic relationship between the author and his subjects lasted for more than a quarter-century, peaking in commercial success around the turn of the century with the color publication Frank Reade Weekly Magazine. 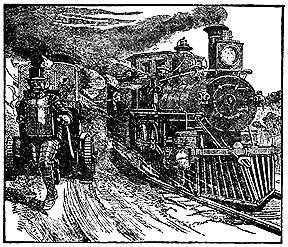 The Steam Man Mark III, circa 1880, depicted during one of its most successful adventures: the tracking, pursuit, and capture of a notorious train-robbing gang. All contents copyright 2000, 2012 Paul Guinan.